There is nothing worse than relaxing within the confines of your own home, and seeing a creepy crawler run across your floor. Typically, you either scream in fear, or run and get something to catch or get rid of that unwanted pest. Often times, if there is one pest hanging around your home, there is a good chance that there are more that you just have not seen. If you find yourself in this predicament, it is important that you act fast, and get rid of the pests before they invade your home! Leave the pest control to professionals. If you are in the St. Paul, MN area, look no further than Eco Tech’s natural pest control treatments. Eco Tech has been providing the St Paul, MN area with pest control services for over fifteen years. One characteristic that sets us apart from our competitors is that we do not require our customers to sign a contract. Keeping the customer’s needs first is our highest priority. To ensure your satisfaction, we also offer a four year service warranty on our pest control plans. The unique difference between our experienced team and our competitors is that we take the health of our customers and pets very seriously. By focusing on using eco-friendly products that will not harm humans, pets, or the environment, our customers can rest assured that poisonous chemicals will not be used in and around their home. 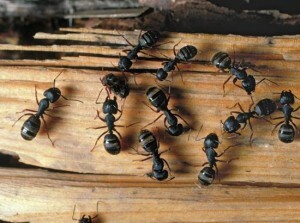 Sometimes, damage caused by these pests may be found during the pest control evaluation. No need to hire another company to fix the damage, let our team fix it for you! That way you only have to deal with one company to provide the pest control and repair any damage as well. So, do not wait to get a pest control treatment once those unwanted insects and bugs have already invaded your home. Contact Eco Tech today in the St Paul, MN area to set up a pest control evaluation. Call us at (763) 785-1414.